hi HealthInnovations, an Optum business and UnitedHealth Group (NYSE:UNH) company, has received a 2015 U.S. Patent for an air conduction hearing test kit used by primary care physicians and other health professionals. The hearing test kit is an affordable and easy-to-use resource to test for hearing loss, a condition that affects more than 48 million people nationwide. A new patented hearing test kit from hi HealthInnovations is making it easier and more affordable for primary care physicians to test for hearing loss (Source: hi HealthInnovations). training and ongoing support from hi HealthInnovations. Many people access the health system through their primary care physician, and consumers are more likely to talk to their primary care physician about hearing loss than they would any other medical or hearing specialist, according to a survey by AARP and the American Speech-Language-Hearing Association. The hearing test kit is available at no cost to many physicians and care professionals in UnitedHealthcare’s national care provider network. All other care professionals can purchase the test kit for $179 each, a significant value compared to some in-office test kits that retail for more than $1,000. 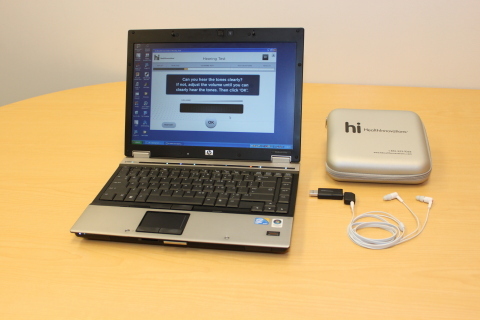 Physicians interested in learning more about the hearing test kit can call hi HealthInnovations at 1-866-334-4425. The test is compliant with ANSI S3.6-1996, a specification for audiometers established by the Food and Drug Administration (FDA). Hearing loss is a significant health issue in the United States and globally; more than 1.1 billion young adults are at risk of developing hearing loss, according to a recent study by the World Health Organization. Spurring the increase is an aging population and more frequent exposure to loud sounds that can cause noise-induced hearing loss, including the growing popularity of earbud headphones. Hearing aids can help more than 90 percent of people with hearing loss; however, hearing aids can cost up to $8,000 a pair, making them unaffordable for many people. hi HealthInnovations sells high-tech, custom-programmed hearing aids – priced from $799 to $999 each – directly to consumers, helping to improve access and affordability of these important devices for everyone. The company also makes available hearing aids at even greater discounts to UnitedHealthcare plan participants, other health plans and directly to employers. hi HealthInnovations offers custom-programmed, digital hearing aids at significant discounts to the 48 million U.S. consumers with hearing loss. These innovative devices are delivered through a national staff and network of audiologists and hearing health professionals who provide hearing tests, fittings, seminars and counseling online, by phone and in person. hi HealthInnovations is an Optum business and part of UnitedHealth Group (NYSE:UNH) , a diversified health and well-being company dedicated to helping people live healthier lives and making health care work better.